Netflix and Nintendo have announced that the Netflix streaming video service is now available to owners of the Nintendo Wii. Streaming to the console will be provided at no extra cost to Wii owners who have a broadband connection and an $8.99 monthly Netflix membership. 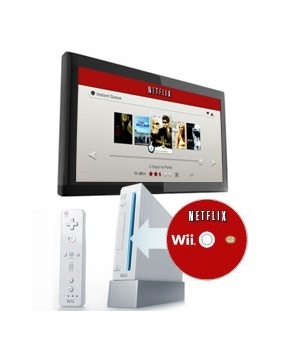 An "instant streaming disc" which must be inserted into the Wii console in order to launch the service is also required and is available from Netflix at no charge. Unlike the Xbox 360 and PlayStation 3, however, the technical limitations of the Wii mean it won't be able to display movies in hi-def. "Launching Netflix on the Wii home console marks a significant advance in the evolution of our service," said Netflix co-founder and CEO Reed Hastings. "Wii has created immense consumer excitement and has meaningfully altered the consumer electronics landscape. Bringing Netflix to Wii catapults us toward our goal of being ubiquitous on the connected devices most popular with consumers." The company is rapidly approaching "mission accomplished" status in that regard: According to Netflix, the Wii "now reaches more consumers than any other device that currently supports streaming movies from Netflix." For more information or to order a Netflix streaming disc for the Wii, check out netflix.com/wii.